Screen Printing – JuBilee Screen Print, Inc. Whether you are trying to represent your group, provide a uniform for your employees, celebrate your family, or raise awareness for your cause, JuBilee can find the right tshirt or sweatshirt for you. We have many different colors and styles available, just let us know what you have in mind and we can help you put the right combination together for you. We have many styles and colors of t-shirts available. From trusted names such as Hanes, Gildan, and Canvas, the options are nearly endless. We have shirts from 100% Cotton to 100% Polyester performance and several blends in between. We are confident we can find the right shirt in the right color for you. As the air begins to chill, you need to think about getting sweatshirts for your company or group. We offer crewneck, hoodie, and zippered sweats from 1/4 to full zip. 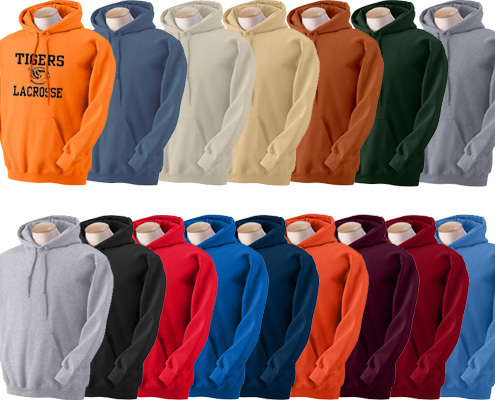 We can get many different weights and fabrics from a standard weight 50/50 sweat to 100% Polyester performance hoodies. With many different manufacturers and styles we are sure to get you what you want. No matter what time of year it is, there is a sport in season. Whether it be Baseball/Softball, Basketball, or Dodgeball, we can make your team the envy of the league. We offer uniforms from companies such as Augusta Sportswear, Badger, and Eagle USA among others.